A while ago, I came upon an app that allowed me to read certain books for free, for a certain amount of time (about a month). It was a Dutch app, so that meant Dutch books, but that didn’t bother me that much (I want to read more Dutch books). 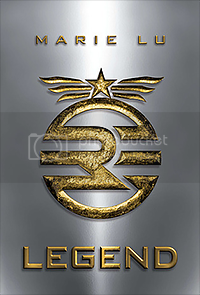 One of the books on the list was ‘Legend‘ by Marie Lu, a book which I had added to my to-read list a long time ago, but never really bothered to read, until now. It was actually a bit of a pity that the book was in Dutch, because I think I might have enjoyed it better (aka given it a higher rating) if I had read it in English, because my god, the writing was so childish. Just like the last Dutch book I read (Outside In). I just looked up the translator of both these books, and found out that both Legend and Outside In were translated by the same person, Sofia Engelsman. So I might just avoid Dutch books translated by her from now on. I just don’t get why you would translate a YOUNG ADULT book to something so childish. It just felt really weird, especially because the subjects in this book were quite dark (the ‘plague’, and the murder of June’s brother, doesn’t really seem like subjects for a children’s book). When I looked past the childish writing, I actually read a good story. I liked every part of it, and though I couldn’t really relate to any of the characters, I definitely enjoyed it. Because the story was Dutch, I got through it really easily (it doesn’t matter how much English I speak/read/write, I will always be a Dutchie on the inside). Legend has two POV’s; Day’s and June’s, and though I kinda ‘hate’ multiple POV’s, these weren’t really that bad. It might be because the two character were so similar, that I didn’t really feel a difference (in another review, I read that the reviewer thought that Day and June were just the same person but with different names and other things, and I kinda agree with that). And the POV’s were just neatly announced, one chapter would be from Day’s POV and the next form June’s. In the end, I enjoyed Legend, and other than the childish Dutch writing, there wasn’t really much I didn’t like about this book. I will definitely read the second book, because I just want to know how the story goes on, and if they ever find Tess and Eden again! If you have Legend on your to-read list, you should definitely go and read it soon!